Physiological monitoring solutions and biofeedback technologies allow sport psychology practitioners to demonstrate physiological changes due to psychological stress, and provide their clients with an enhanced awareness of their stress response. These technologies can also provide evidence for the efficacy of stress management techniques, whether cognitive or physiological in nature. In this article, we present a protocol that uses multiple physiological signals to demonstrate how psychological stress can manifest in the body, and then evidence heart rate variability biofeedback as a stress management technique. Using insights from applied consultations, we focus on the delivery of the protocol through phases of baseline resting measures, stressor tasks, and post-stressor recovery. This article provides an accessible use of physiological monitoring and biofeedback technologies in sport psychology practice, so that practitioners may adopt and adapt this protocol for their purposes and available equipment. Biofeedback technology, where subjects view their live-feed physiological signals, is used to facilitate greater interoceptive awareness and learn individualized stress management techniques via operant conditioning. A growing body of evidence attests the usefulness of biofeedback technologies for directly and indirectly enhancing performance (e.g., Gevirtz, 2013 Gevirtz, R. (2013). The promise of heart rate variability biofeedback: Evidence-based applications. Biofeedback, 41(3), 110–120. doi:10.5298/1081-5937-41.3.01[Crossref], , [Google Scholar]; Jiménez Morgan & Molina Mora, 2017 Jiménez Morgan, S., & Molina Mora, J. A. (2017). Effect of heart rate variability biofeedback on sport performance, a systematic review. Applied Psychophysiology and Biofeedback, 42(3), 235–245. doi:10.1007/s10484-017-9364-2[Crossref], [PubMed], [Web of Science ®], , [Google Scholar]). Indeed, sophisticated biofeedback equipment has been used by elite and professional sports teams such as the World Cup winning Italian football team (Wilson, Peper, & Moss, 2006 Wilson, V. E., Peper, E., & Moss, D. (2006). “The Mind Room” in Italian Soccer Training: The Use of Biofeedback and Neurofeedback for Optimum Performance. Biofeedback, 34(3), 79–81. [Google Scholar]). However, there are equipment options to suit varied budgets, and the growth of peripheral and inbuilt sensors with mobile devices may be the future of biofeedback interventions (Heathers, 2013 Heathers, J. A. J. (2013). Smartphone-enabled pulse rate variability: An alternative methodology for the collection of heart rate variability in psychophysiological research. International Journal of Psychophysiology, 89(3), 297–304. doi:10.1016/j.ijpsycho.2013.05.017[Crossref], [PubMed], [Web of Science ®], , [Google Scholar]). Some detailed example interventions that provide technical details using these products have been published (e.g., Strack, Linden, & Wilson, 2011 Strack, B., Linden, M., & Wilson, V. S. (Eds.). (2011). Biofeedback & neurofeedback applications in sport psychology. Wheat Ridge, CO: AAPB. [Google Scholar]). However, research-focused literature is often too technical for practitioners who need quick-reference examples of how to deliver biofeedback interventions in sport settings. Several physiological measures can be used in biofeedback interventions and heart rate variability (HRV) is popular because HRV statistics can index parasympathetic nervous system activation (Laborde, Mosley, & Thayer, 2017 Laborde, S., Mosley, E., & Thayer, J. F. (2017). Heart rate variability and cardiac vagal tone in psychophysiological research – recommendations for experiment planning, data analysis, and data reporting. Frontiers in Psychology, 8, 213. doi:10.3389/fpsyg.2017.00213[Crossref], [PubMed], [Web of Science ®], , [Google Scholar]), and assess relative states of health and stress (Thayer, Ahs, Fredrikson, Sollers III, & Wager, 2012 Thayer, J. F., Ahs, F., Fredrikson, M., Sollers, J. J., I. I. I., & Wager, T. D. (2012). A meta-analysis of heart rate variability and neuroimaging studies: Implications for heart rate variability as a marker of stress and health. Neuroscience and Biobehavioral Reviews, 36(2), 747–756. doi:10.1016/j.neubiorev.2011.11.009. [Crossref], [PubMed], [Web of Science ®], , [Google Scholar]). HRV is the change in intervals between neighboring heart beats due to interdependent regulatory processes such as the autonomic nervous system and heart-brain interactions (Shaffer, McCraty, & Zerr, 2014 Shaffer, F., McCraty, R., & Zerr, C. L. (2014). A healthy heart is not a metronome: An integrative review of the heart’s anatomy and heart rate variability. Frontiers in Psychology, 5, 1–19. doi:10.3389/fpsyg.2014.01040[Crossref], [PubMed], [Web of Science ®], , [Google Scholar]). Broadly, increased HRV indicates effective sport-related decision making under pressure (Laborde, Raab, & Kinrade, 2014 Laborde, S., Raab, M., & Kinrade, N. (2014). Is the ability to keep your mind sharp under pressure reflected in your heart? Evidence for the neurophysiological bases of decision reinvestment. Biological Psychology, 100, 34–42. doi:10.1016/j.biopsycho.2014.05.003. [Crossref], [PubMed], [Web of Science ®], , [Google Scholar]), and both acute and chronic adaptive responses to training (Buchheit, 2014 Buchheit, M. (2014). Monitoring training status with HR measurements: do all roads lead to Rome? Frontiers in Physiology, 5, 1–19. doi:10.3389/fphys.2014.00073[Crossref], [PubMed], [Web of Science ®], , [Google Scholar]). HRV biofeedback is noninvasive and therapeutic benefits have been reported for various clinical conditions (Lehrer & Gevirtz, 2014 Lehrer, P. M., & Gevirtz, R. (2014). Heart rate variability biofeedback: How and why does it work? Frontiers in Psychology, 5, 1–9. doi:10.3389/fpsyg.2014.00756[Crossref], [PubMed], [Web of Science ®], , [Google Scholar]; Shaffer et al) and sporting performances (Jiménez Morgan & Molina Mora, 2017 Jiménez Morgan, S., & Molina Mora, J. A. (2017). Effect of heart rate variability biofeedback on sport performance, a systematic review. Applied Psychophysiology and Biofeedback, 42(3), 235–245. doi:10.1007/s10484-017-9364-2[Crossref], [PubMed], [Web of Science ®], , [Google Scholar]). Coupled with the ease of learning and scant contraindications, the therapeutic effects of HRV biofeedback make it an attractive stress management intervention in elite sport settings. The Lehrer, Vaschillo, and Vaschillo (2000 Lehrer, P. M., Vaschillo, E., & Vaschillo, B. (2000). Resonant frequency biofeedback training to increase cardiac variability: Rationale and manual for training. Applied Psychophysiology and Biofeedback, 25, 177–189. [Crossref], [PubMed], [Web of Science ®], , [Google Scholar]) resonance frequency model of HRV biofeedback explains how bespoke abdominal breathing paces, near six breaths per minute, can be identified and trained for therapeutic effects on-demand. Resonance frequency breathing utilizes respiratory sinus arrhythmia (RSA), an innate effect of heart rate increases with inhalation, and decreases with exhalation, to create maximal HRV and blood pressure variation. This blood pressure variation stimulates the body’s control of vascular stiffness known as the baroreflex (Shaffer, McCraty, & Zerr, 2014 Shaffer, F., McCraty, R., & Zerr, C. L. (2014). A healthy heart is not a metronome: An integrative review of the heart’s anatomy and heart rate variability. Frontiers in Psychology, 5, 1–19. doi:10.3389/fpsyg.2014.01040[Crossref], [PubMed], [Web of Science ®], , [Google Scholar]), which buffers against extreme increases and decreases in blood pressure and takes a few seconds to occur. It is these delays which produce a resonance frequency of approximately 10 sec, corresponding to 0.1 Hz and six breaths per minute (4-sec inhale, 6-sec exhale; Lehrer et al). Baroreflex signals provide the brain stem with a visceral context from which autonomic emotional responses are formed (Thayer et al., 2012 Thayer, J. F., Ahs, F., Fredrikson, M., Sollers, J. J., I. I. I., & Wager, T. D. (2012). A meta-analysis of heart rate variability and neuroimaging studies: Implications for heart rate variability as a marker of stress and health. Neuroscience and Biobehavioral Reviews, 36(2), 747–756. doi:10.1016/j.neubiorev.2011.11.009. [Crossref], [PubMed], [Web of Science ®], , [Google Scholar]) and stress-related blood pressure increases can be inhibited (Saku et al., 2014 Saku, K., Kishi, T., Sakamoto, K., Hosokawa, K., Sakamoto, T., Murayama, Y., … Sunagawa, K. (2014). Afferent vagal nerve stimulation resets baroreflex neural arc and inhibits sympathetic nerve activity. Physiological Reports, 2(9), e12136. doi:10.14814/phy2.12136[Crossref], [PubMed], , [Google Scholar]). In summary, HRV biofeedback works by using RSA (via abdominal breathing) to increase HRV and blood pressure variability, which invokes baroreceptor reflexes to maintain context-appropriate blood pressure and provide a relaxed yet adaptable internal context for emotional responding. When coupled with breathing measures, HRV biofeedback enables dose-response observations which can provide participants with insight into physiological and psychological stress management. In addition to HRV and breathing, Galvanic Skin Response (GSR) data can reliably reflect stress response (sympathetic) activation with a physiological delay of ∼3–5 sec (Critchley, Elliot, Mathias, & Dolan, 2000 Critchley, H. D., Elliott, R., Mathias, C. J., & Dolan, R. J. (2000). Neural Activity Relating to Generation and Representation of Galvanic Skin Conductance Responses: A Functional Magnetic Resonance Imaging Study. The Journal of Neuroscience, 20(8), 3033. http://www.jneurosci.org/content/20/8/3033.short[Crossref], [PubMed], [Web of Science ®], , [Google Scholar]). GSR is the change in skin electro-conductivity from micro secretions of sweat due to sympathetic pathways, and is often used for biofeedback interventions (e.g., Toomin & Toomin, 1975 Toomin, M. K., & Toomin, H. (1975). GSR biofeedback in psychotherapy: Some clinical observations. Psychotherapy: Theory, Research & Practice, 12(1), 33–38. [Crossref], [Web of Science ®], , [Google Scholar]) because it is an intuitive indicator of stress. Concurrent biofeedback indices can complement each other in protocols with baseline, stressor, and recovery phases to provide clients with increased awareness of the physiological manifestations of stress and effective management techniques thereafter. Indeed, this article describes how biofeedback technology can bring participants’ data “to life” to demonstrate the physiological manifestations of psychological stress and introduce HRV biofeedback as a stress management intervention. We provide a detailed description of the protocol delivery used in our practice, where GSR and breathing data provide reliable and intuitive indicators of momentary stress levels, then HRV data are explained to evidence the stress management efficacy of HRV biofeedback interventions. We deliver this protocol in group or individual sessions with athletes, coaches, and support staff prior to further HRV biofeedback protocols to enhance emotional regulation and performance under pressure (e.g., Gross et al., 2016 Gross, M. J., Shearer, D. A., Bringer, J. D., Hall, R., Cook, C. J., & Kilduff, L. P. (2016). Abbreviated resonant frequency training to augment heart rate variability and enhance on-demand emotional regulation in elite sport support staff. Applied Psychophysiology and Biofeedback, 41(3), 263–274. doi:10.1007/s10484-015-9330-9[Crossref], [PubMed], [Web of Science ®], , [Google Scholar], 2017 Gross, M. J., Hall, R., Bringer, J. D., Cook, C. J., Kilduff, L. P., & Shearer, D. A. (2017). Resonant frequency training in elite sport: A case study example. Journal of Sport Psychology in Action, 8(3), 173–183. [Taylor & Francis Online], [Web of Science ®], , [Google Scholar]). Following sensor fitting and data fidelity checks, the protocol includes a baseline phase and two bouts of stressor and post-stressor recovery phases. In-depth discussions of the physiological data occur during post-session reviews, where GSR and breathing data indicate fluctuating stress levels (i.e., comparing stressor impact and recovery effectiveness), and HRV and blood pressure variability are discussed in the context of managing stress for athletic performance. We inform participants that the protocol involves cognitive tasks designed to be mildly stressful. After fitting sensors to the subject, the practitioner briefly explains the how the sensors work and uses live graphical data displays to support these explanations, confirm sensor accuracy (adjusting if necessary), and explain the physiological concepts. For example, we use finger photoplethysmography (PPG) to record HRV and demonstrate HRV via the variable gaps displayed between peaks in participants’ live PPG signal. This helps participants understand that to be adaptable, their heart must rapidly change its pace in response to internal and external stimuli, such as digesting meals or evading threats. Breathing data can be demonstrated by on-demand deep breaths, which cause upward and downward trends in live breathing data with inhalation and exhalation (respectively). GSR can be described as an equivalent of the alert response in cats, where tails raise and hairs stand upright. We also often mention that GSR is used in the “polygraph test” or “lie detector”, which many are familiar with. The GSR sensors should be placed on participants’ dominant hand to control for potential asymmetry in responsiveness (Picard et al., 2015 Picard, R. W., Fedor, S., & Ayzenberg, Y. (2015). Multiple arousal theory and daily-life electrodermal activity asymmetry. Emotion Review, 8(1), 62–75. [Crossref], [Web of Science ®], , [Google Scholar]). Light-hearted comments confirming that GSR sensors only measure rather than send electricity can build rapport and comfort anxious participants. Conversely, confident participants may like to see an instant demonstration of their GSR response which can be honored with an unexpected hand-clap close to their face, reliably followed by an upward trend in GSR values. Stable measures of HRV, breathing, and GSR at rest are required as a comparison to the stressor and recovery periods, and this should be articulated to participants. Recent advice suggests that 2-min are adequate to capture a resting state HRV snapshot (Laborde et al., 2017 Laborde, S., Mosley, E., & Thayer, J. F. (2017). Heart rate variability and cardiac vagal tone in psychophysiological research – recommendations for experiment planning, data analysis, and data reporting. Frontiers in Psychology, 8, 213. doi:10.3389/fpsyg.2017.00213[Crossref], [PubMed], [Web of Science ®], , [Google Scholar]) and little rationale exists to extend resting measures for breathing or GSR. Practitioners can leave the room during baseline measures to remove the presence of “other” effects (Kleck et al., 1976 Kleck, R. E., Vaughan, R. C., Cartwright-Smith, J., Vaughan, K. B., Colby, C. Z., & Lanzetta, J. T. (1976). Effects of being observed on expressive, subjective and physiological responses to painful stimuli. Journal of Personality and Social Psychology, 34(6), 1211–1218. doi:10.1037/0022-3514.34.6.1211[Crossref], [PubMed], [Web of Science ®], , [Google Scholar]). Following Baseline measures, the practitioner can provide instructions for the 10-trial simple Stroop test. A simple Stroop test is an interference reaction time test in which names of colors (e.g., blue) are presented on a screen printed in a different color font (e.g., red) to the named word. For each trial, participants are required to call out the color of the font seen (i.e., not read the word) within three seconds. We automate this test in our biofeedback software, however presentation software or free online tests can be used provided test start and end times can be identified in physiological data. Prior to the test, the practitioner can manipulate participants’ difficulty expectations to increase the impact on physiological data. A score can be provided after the test and practitioners should move swiftly into Recovery 1 which asks participants to use any relaxation techniques they know to reduce GSR values as far as possible in 2-min. Almost exclusively, maximal GSR values are reached during the Stroop test and a timely transition into Recovery 1 instructions ensures similar starting values. Maximal and live GSR data are shown on-screen in numerical and graphic representations because they are immediate and intuitive, and participants are instructed to monitor live values as they try to relax. If they have never used relaxation techniques, participants are instructed to recall a time that they were relaxed. 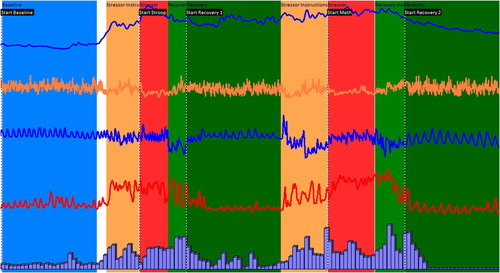 If available technology does not allow computed or custom physiological values, practitioners can record peak values in session notes and refer to these in discussions. We have found that commentary on the change in GSR values during Recovery 1 can increase difficulty for the participant. Comments such as “that’s the wrong direction, come on, relax!”, announcing the remaining time, or providing a target GSR value can achieve this simulation. Stressor 2 is an arithmetic task where participants serially subtract 13 from 1084 and vocalize as many answers as possible in 60 sec, returning to the start if errors are made. The practitioner should call out “correct” for successful calculations and provide a score (number of successful calculations) upon completion. More so than Stressor 1, this task reliably invokes physiological stress, which can be enhanced by distractions such as contaminating participants’ working memory with other numbers, or prior queries into their mental arithmetic capabilities. After the task, practitioners should move swiftly into Recovery 2 which introduces paced abdominal breathing at six breaths per minute (4-sec inhale, 6-sec exhale; Lehrer et al., 2000 Lehrer, P. M., Vaschillo, E., & Vaschillo, B. (2000). Resonant frequency biofeedback training to increase cardiac variability: Rationale and manual for training. Applied Psychophysiology and Biofeedback, 25, 177–189. [Crossref], [PubMed], [Web of Science ®], , [Google Scholar]). Breathing is guided by a simple on-screen bar graph in our software, however free websites or mobile device applications can be used. Practitioners should ensure participants’ abdominal breathing, advise them not to completely fill and empty their lungs, and to breathe through their nose or mouth as comfort dictates. A common solution to participants who struggle with abdominal breathing is to place their hands on their chest and navel, then observe as they attempt to move the hand on the navel rather than the chest. We use a dual line graph plotting heart rate and breathing so that the practitioner can monitor breathing against the pacing stimulus and provide coaching tips. Similarly, on-screen numerical displays of breathing rate and both live and new maximal GSR (reliably achieved during Stressor 2) values allow the practitioner to monitor the relaxation achieved. In our experience, six breaths per minute reliably relaxes participants as demonstrated in HRV, GSR, and subjective reports. RSA and increased HRV can usually be seen after two breath cycles, however conscious relaxation commonly requires 4 or more breaths, and we conduct Recovery 2 for 2 min for comparable data with both Recovery 1 and Baseline. Physiological variables such as total blood volume impact effectiveness of breathing paces for relaxation (Lehrer et al. 2000 Lehrer, P. M., Vaschillo, E., & Vaschillo, B. (2000). Resonant frequency biofeedback training to increase cardiac variability: Rationale and manual for training. Applied Psychophysiology and Biofeedback, 25, 177–189. [Crossref], [PubMed], [Web of Science ®], , [Google Scholar]), so slower paces with the same 2:3 ratio (e.g., five breaths per minute; 4.8-sec inhale, 7.2-sec exhale) can be used for taller and broader individuals. As per Recovery 1, the practitioner can comment on the change in GSR data and in our experience, these comments do not have the same aversive effects as in Recovery 1. This disparity strengthens post-session discussions on the efficacy of slow abdominal breathing for relaxation. We begin post-session reviews and discussion by ensuring that data are saved, removing physiological sensors, and ensuring participant comfort before showing a session overview (see Figure 1) and explain each data series. At differing points throughout the discussion, we focus on HRV, GSR, PPG, and breathing data, along with computer calculated metrics of heart and breathing rates. Starting with Baseline, we use an on-screen zoom function to view specific phases of the protocol and revisit individualized discussion points. Figure 1. Biofeedback protocol session overview. In our experience, 2-min Baseline data show rhythmic breath cycles at approximately 12 breaths per minute, variable heart rate reflecting RSA, and decreasing GSR from beginning to end. Participants often request to know their resting heart rate which provides a good opportunity to revisit HRV as reflection of adaptability to internal and external demands. We emphasize that when they are relaxed, breathing patterns are deep and rhythmic and heart rate is variable. However, we rarely mention HRV statistics at this stage because they are not necessary to convey this information and have complicated this insight for some participants. Nevertheless, providing an average heart rate from the Baseline period provides another metric to measure stressor effects and we often set visible threshold lines in our software to enable visual comparisons between phases. As Figure 1 illustrates, an increase in GSR from Baseline often occurs during Stroop instructions which can be used to highlight arousal and anticipatory stress. GSR commonly peaks during the first 3–5 Stroop trials after participants have realized that the test is within their capabilities. This peak and subsequent “recovery” can be analogous to settling into a sporting performance. During the Stroop, breathing and heart rates increase while breath depth decreases. We have found that linking these changes to a stress response primes participants for discussions on the effectiveness of regulated breathing for relaxation and recovery from stress. To begin Recovery 1 discussions, we ask participants what relaxation technique(s) was used (e.g., fixation on a visual cue, relaxing muscles). We generally find that these techniques moderately decrease GSR, however the trend can reverse if aversive comments are used. Independent of the technique used and as shown in Figure 1, participants show slower, deeper, and rhythmic breathing patterns compared to Stressor 1. Again, we highlight these breathing patterns and the concomitant changes in heart rate to prime Recovery 2 discussions, suggesting that they already know to use breathing to relax, just not at an optimally slow pace. By design, participants find Stressor 2 more stressful than Stressor 1, and this is reflected in physiological data. We frequently see an increase in GSR values during Stressor 2 instructions, and this is a key talking point in our review and discussions. Akin to Stressor 1, GSR may peak early and plateau or decrease towards the end, and shallower breaths with increases in both heart and breathing rates can be seen. Participant calculation errors or practitioner intrusive comments may be reflected in GSR as upward inflexions and further demonstrates the physiological impact of psychological stress. We then discuss how a hyperactive stress response may not support optimal athletic performances. These implications are intuitive for participants from self-paced and closed skill sports, and for others, we focus discussions on the implications for optimal preparation and recovery. The key message we convey here is not that stress is inherently negative for performance, rather that performers should be aware of the effects and learn to manage it to their advantage. We ask participants for their feedback on their experience of the paced breathing activity in Recovery 2, and nearly all report ease in following the pacing stimulus and most report relaxation effects. We initially focus discussions on GSR data as indicators of stress and because they almost unanimously display a decrease towards Baseline values from the session maximum reached during Stressor 2 (see Figure 1). We then mention that there was a larger recovery burden for Recovery 2, and provide a dose-response insight in to how resonance frequency breathing reduces physiological stress by showing the reduction in breathing rate and increase in both RSA and HRV. We then use the zoom function to show two breath cycles of PPG, breathing, and heart rate data to demonstrate how this increased HRV exercises the body’s blood pressure regulation system (i.e., the baroreflex; Shaffer, McCraty, & Zerr, 2014 Shaffer, F., McCraty, R., & Zerr, C. L. (2014). A healthy heart is not a metronome: An integrative review of the heart’s anatomy and heart rate variability. Frontiers in Psychology, 5, 1–19. doi:10.3389/fpsyg.2014.01040[Crossref], [PubMed], [Web of Science ®], , [Google Scholar]). 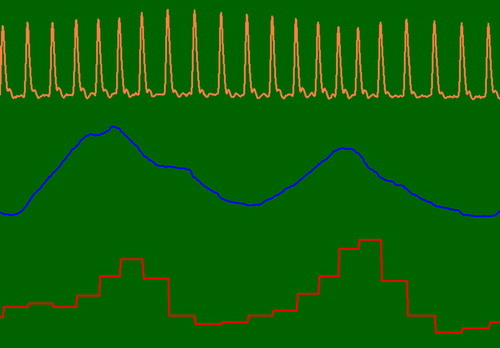 As shown in Figure 2, gaps between heart beats show heart rate increasing with inhalation (smaller gaps) and decreasing with exhalation (larger gaps), and varying peak amplitudes indicate changes in artery (and capillary) stiffness in response to changing heart rate (Shaffer et al). For psychological stress, we explain how stimulating the baroreflex inhibits blood pressure increases due to stress (Saku et al., 2014 Saku, K., Kishi, T., Sakamoto, K., Hosokawa, K., Sakamoto, T., Murayama, Y., … Sunagawa, K. (2014). Afferent vagal nerve stimulation resets baroreflex neural arc and inhibits sympathetic nerve activity. Physiological Reports, 2(9), e12136. doi:10.14814/phy2.12136[Crossref], [PubMed], , [Google Scholar]) and forms a relaxed internal context from which autonomic emotional responses are formed (Thayer et al., 2012 Thayer, J. F., Ahs, F., Fredrikson, M., Sollers, J. J., I. I. I., & Wager, T. D. (2012). A meta-analysis of heart rate variability and neuroimaging studies: Implications for heart rate variability as a marker of stress and health. Neuroscience and Biobehavioral Reviews, 36(2), 747–756. doi:10.1016/j.neubiorev.2011.11.009. [Crossref], [PubMed], [Web of Science ®], , [Google Scholar]), among other therapeutic effects (e.g., mindfulness related focus on breathing; Lehrer & Gevirtz, 2014 Lehrer, P. M., & Gevirtz, R. (2014). Heart rate variability biofeedback: How and why does it work? Frontiers in Psychology, 5, 1–9. doi:10.3389/fpsyg.2014.00756[Crossref], [PubMed], [Web of Science ®], , [Google Scholar]). Figure 2. Final two breath cycles in Recovery 2. Participants can instantly recognize that blood pressure is elevated under stress, but may not realize that HRV and blood pressure variability are decreased and so too is their social, emotional, and environmental adaptability. The best analogy we have found is to discuss the colloquial term “hangry” as a state of physiological stress, where hunger increases the propensity for negative emotional states or shortness of patience. We often say “When hangry, your body is telling your brain to focus on acquiring food and that you’re not able take on new tasks or deal with more stress until you eat. Blood pressure and heart rate are similar in that elevated levels, but reduced variability, send similar messages to the emotional centers of your brain. Breathing at slow paces to create those changes in heart rate and stimulate blood pressure regulation inverts those messages into ‘relaxed’ and ‘adaptable’.” So as not to over-complicate these insights we refrain from discussing HRV statistics unless participants are particularly interested or have relevant knowledge. To conclude the presentation, we discuss when participants need to manage stress, when they could apply resonance frequency breathing in life and sport, and previous instances when it may have helped. Following discussions of previous stressful experiences, we begin further HRV biofeedback protocols by identifying the participant’s optimal breathing pace as per Gross et al. (2016 Gross, M. J., Shearer, D. A., Bringer, J. D., Hall, R., Cook, C. J., & Kilduff, L. P. (2016). Abbreviated resonant frequency training to augment heart rate variability and enhance on-demand emotional regulation in elite sport support staff. Applied Psychophysiology and Biofeedback, 41(3), 263–274. doi:10.1007/s10484-015-9330-9[Crossref], [PubMed], [Web of Science ®], , [Google Scholar], 2017 Gross, M. J., Hall, R., Bringer, J. D., Cook, C. J., Kilduff, L. P., & Shearer, D. A. (2017). Resonant frequency training in elite sport: A case study example. Journal of Sport Psychology in Action, 8(3), 173–183. [Taylor & Francis Online], [Web of Science ®], , [Google Scholar]). We also provide options for free breath pacing applications on mobile devices, and encourage participants to regularly practice in diverse situations in order to learn the breath pace and negate the need for a pacing stimulus. Following this practice, our participants have incorporated their optimal (resonance frequency) breathing paces into daily routines, performance preparations, skill-specific routines, and recovery processes. Consistent with the growing research interest into HRV biofeedback, the reported benefits include competitive anxiety management, relaxation between performance bouts, improved sleep quality, preemptive and reactive stress reduction, and minimized pain during exercise recovery. We have also found that these experiences promote further sport psychology support and interest in associated interventions such as mindfulness, likely due to the profound dose-response experience. Indeed, we think that objective demonstrations of psychological skills and their therapeutic mechanisms is a strong rationale for practitioners to regularly use biofeedback technologies. The authors would like to thank the Sports Council for Wales for their continued co-operation and support.